Editor’s Note: The following article is reprinted from the Today@PC World blog on PCWorld.com. That was Apple’s tagline for this past week’s Macworld Expo, and by that, they probably meant the MacBook Air. The ultraportable laptop was the show-stealer of Steve Jobs’s keynote address, but it may not have even been Apple’s most significant product announcement of the show. For everything that was “in the air” at Macworld Expo, there were pre-show rumors that didn’t pan out, products that didn’t receive enough attention, and announcements ripe for second-guessing. Here’s a recap of what didn’t show its face at Expo, what happened instead, and whether any of it will make a difference in the long run.
? Hoax! Despite the pre-Macworld rumors that rapper Jay-Z would be tapped to spearhead an Apple music label, nothing of the sort happened. Randy Newman was the only musician to perform live at the keynote, and he’s pretty much the opposite of Jay-Z. One reason for Jay-Z’s absence may have been a last-minute beef with Steve Jobs over Jay-Z’s cameo appearance in Bill Gates’s CES farewell video. But that reason’s completely made up… just like the whole “Jay-Z left Def Jam for Apple” rumor. Looks like NAS took this round against Jay-Z. Unfortunately, rap-beef aficionados, that’s NAS as in “network-attached storage,” not “Illmatic.” Apple’s new Time Capsule, a wireless-N router with a built-in 500GB or 1TB hard drive, is aimed to ease back-up and storage in conjunction with Mac OS X Leopard’s Time Machine application. Could this be the reason for Jay-Z’s absence? Maybe he heard NAS would be at Macworld and steered clear of the Moscone Center. The timing seemed too good to be true: Intel released its energy-efficient Mobile Penryn processors about a week before Macworld Expo. Naturally, Intel’s new 45-nanometer processor would be the centerpiece of any new Apple laptops, what with their battery-saving efficiency and beefed-up L2 cache. Right? Well, no… at least not yet. There’s something in the Air, but it’s not Intel’s current-gen chip. Instead of the brand-new Penryn processor, Apple worked with Intel to build a customized, shrunken-down version of its 65-nanometer Core 2 Duo processor. This CPU joins the MacBook Air’s miniaturized motherboard and non-removable battery in the ultraportable’s list of unique internal components. With all that internal customization, will Penryn show up in the MacBook and MacBook Pro before the Air? And will there need to be a customized version of the Penryn processor in future versions of the MacBook Air, or will the normal Penryn processor work? WiMax was a major buzzword at CES this year, with Sprint Nextel pasting advertisements for its far-reaching, high-speed, semi-pronounceable Xohm wireless network all over the place. Sprint and Verizon already have EV-DO networks, untethering anyone with a laptop and an EV-DO card from Wi-Fi hotspots. And while anyone with an iPhone currently has to settle for EDGE and Wi-Fi connections, AT&T has an HSDPA network of its own that could lay the foundation for the much-coveted 3G iPhone. The MacBook Air is sleek and light, but a cellular card would make that extreme portability even more attractive to potential buyers: they could wander anywhere with a solid cell signal and stay connected away from a Wi-Fi hotspot. What’s more, a combined monthly iPhone and MacBook Air HSDPA bill through AT&T could be a nice way to consolidate bills (albeit one that could induce serious sticker shock). Hey, Apple’s great at integrating iPods with everything. Why not use those integration skills for the bills? With an 802.11n card on board, the MacBook Air make a trade-in. Instead of the “stay connected everywhere” nature of a cellular card, it gets the better-than-802.11g range and speed of a wireless N network. Keep in mind that you’ll need a wireless N router to make the most of the MacBook Air’s 802.11n card. Of course, Apple’s AirPort Extreme router and its new Time Capsule device provide that high-speed Wi-Fi access. And if you have other computers on your network that only connect at 802.11b/g speeds—or if you leave your Wi-Fi home network open for anyone to hop on the Web—keep in mind that any device with a wireless-G or wireless-B card can slow down that 802.11n network. That’s even the case if you’re connected to a wireless-N router with a wireless-N device. Adding to the MacBook Air’s connectivity limitations is the lack of an Ethernet port, which means Wi-Fi’s the only way to go. Well, kind of: you could pick up a USB-to-Ethernet adapter to ensure you’ve got a back-up connectivity option on the road, but that would take up the MacBook Air’s sole USB port. Speaking of USB ports, you’d also max them out by plugging in a USB mouse, which is common for the kind of road warrior that might be attracted to the MacBook Air. At least the Ethernet and USB conundrums have workarounds; the lack of a FireWire port on the MacBook Air could be a serious deal-breaker for anyone planning to edit video on it. For a company that prides itself on its multimedia chops and its “for the people” media-editing apps, FireWire is a curious omission to the MacBook Air’s array of ports. In the Air Instead: Best Touchpad Ever? Could the MacBook Air’s touchpad be a USB-mouse killer? The nifty, gesture-friendly touchpad looks enticing enough to make using a mouse with the Air less likely, even for road warriors. Still, there are plenty of people out there who don’t like using touchpads, so having only one USB port might be something to think about if they swear by a travel mouse. As Harry McCracken points out in this analysis of the MacBook Air, the 80GB MacBook Air uses the same 1.8-inch hard drive found in the 80GB iPod Classic. So why not release a 160GB version of the MacBook Air with the same 1.8-inch hard drive found in the 160GB iPod Classic? Fear of cannibalizing potential Time Capsule sales? The 64GB solid-state drive (SSD) option on the MacBook Air got a lot of people excited, but it comes at a hefty price. With the solid-state drive and the slower 1.6GHz Intel Core 2 Duo CPU, the MacBook Air will cost just short of $2,800. With the base configuration (80GB hard drive and a 1.6GHz CPU), the Air comes in at $1,799. That means it’s an extra $1,000 for the solid-state drive option alone — that’s about the same price as a MacBook. Still, the SSD could mean a faster start-up time, a very quiet computer, and great battery life for the MacBook Air in that configuration. The same “why no 160GB MacBook Air?” argument applies here, except in reverse. If the MacBook Air can house a 64GB solid-state drive in its ultra-thin frame, why not pack that same amount of solid-state storage into the iPhone and iPod Touch? The iPhone maxes out at 8GB and the iPod Touch hits the ceiling at 16GB. A 32GB version of the iPod Touch would most likely be a hot seller, as would a 16GB version of the iPhone. Those higher-capacity portables are probably coming soon, but it would have been nice to see them now. Finally, iPhone users can text-message more than one person at a time. The new Google Maps location-finding feature is also a great addition to the iPhone firmware, as is the ability to bookmark Web pages and launch them from an icon on the iPhone home screen. Plus, the new iPod Touch apps (e-mail, Google Maps, stock info, a notepad, and weather information) truly make it the same thing as the first-released iPhone without the phone. However, Apple is charging $20 for these iPod Touch firmware updates; iPhone owners get them for free. I’ve talked to a few iPod Touch owners who don’t appreciate the nickel-and-diming. Back in September, Apple ruffled some feathers when they dropped the price of the iPhone without introducing a new model or new storage capacities for the phone. Now, they’ve announced a new laptop without making price cuts to the other notebooks in its stable. Could the MacBook and MacBook Pro’s prices be dropping soon? Well, it might not even matter. Both are better buys than the MacBook Air as it is. 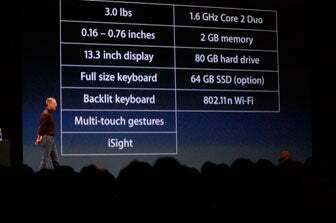 Steve Jobs shows off the MacBook Air’s specs. At least in terms of price, Apple is positioning the MacBook Air as its mid-level laptop, shoehorned in between the entry-level MacBook and the high-end MacBook Pro. When you look at each laptop’s features and components, however, the Air is actually the lowest-end laptop Apple offers. For $1,099, the base version of the MacBook has a faster processor (2.0GHz Intel Core 2 Duo), equal storage capacity (80GB), an internal combo drive, and a better array of ports (Ethernet, FireWire 400, and two USB ports). The high-end configuration of the MacBook has an even faster 2.2GHz Core 2 Duo, a 160GB hard drive, a double-layer SuperDrive, and the same array of ports… all for $300 less than the MacBook Air. At 5 lbs., the MacBook isn’t exactly an anvil, either. As for the MacBook Pro, the 17-inch fully loaded version features a NVIDIA GeForce 8600M GT graphics card, a wider array of ports (including a FireWire 800 port and an ExpressCard slot), and a 2.4GHz or 2.6GHz Core 2 Duo processor for $2,799. That’s still less than the 64GB SSD / 1.8GHz MacBook Air. Unless sheer sleekness is what you’re after, the MacBook and the MacBook Pro are both smarter buys. The lack of any talk involving high-def DVD formats underscored one of the main differences between Expo and CES. At CES, much of the buzz was about the HD DVD format being “dead,” thanks to Warner Bros. announcing right before the show that the studio would be going Blu-ray-only. But at Macworld Expo? With no optical drives in the MacBook Air and Apple TV’s rebirth as a standalone set-top video rental and purchase box, Apple’s banking on the fact that the future of high-def movie delivery isn’t on a disc or in any other tangible format. And they’re probably right. 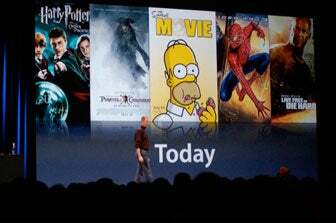 iTunes movie rentals made up a large chunk of Steve Jobs’ keynote. HD DVD? Blu-ray? How about neither. Apple is positioning itself to be a leader in the HD download war, a fact that could be a catalyst in making both high-def DVD formats obsolete. The bulk of the time in Steve Jobs’s keynote was devoted to presenting the Apple TV’s new video rental service and computer-free features. With all the major movie studios on board for the rental and purchasing options, Apple turned an also-ran announcement at last year’s Macworld Expo—the Apple TV—into a more intriguing device with a bright future. Netflix has a set-top box in the works, and the Vudu set-top box already lets you rent and buy movies from your couch. However, thanks to Apple TV’s wider focus—YouTube videos, music from iTunes, podcasts, and Flickr photosets—it looks like Apple TV has the edge in terms of content options, brand recognition, and buzz factor. Most importantly, Apple TV 2.0 may prove to be the best convergence of online and television experiences yet. Macworld Expo is not like CES. CES is all about clamoring for attention; with so many vendors announcing new products, so little time to see it all, and so much ground to cover, every company is in a competition to grab your eyeballs. The impact on show-goers’ psyches is noticeable after a couple of days. The combination of over-stimulation, information overload, mental/physical exhaustion, and the sheer amount of people in the Las Vegas Convention Center has created a signature “CES walk.” Around the middle of day two of the show, you’ll notice most people wandering around somewhat aimlessly, somewhat emotionless, with their eyes glazed over. Expo, on the other hand, is quite the opposite. Everyone’s there for the same thing. Everyone’s there for one company. Apple doesn’t need to clamor for attention; they’re there, they’re in charge, and they know you want to know what they’ve been up to. Throw in the fact that people who love Apple seriously love Apple, and you can probably guess what it’s like when the doors open for Steve Jobs’s keynote. It’s an insane rush to the front, complete with elbowing, grunting, sprinting, screaming, and general apathy for the other showgoers. Apple doesn’t need the Beatles on iTunes; Apple is the Beatles.